The Columbia winery - not to be confused with Columbia Crest - has a long, storied history in Washington state. By pure coincidence, it was the first Washington winery I set foot in back in the mid 90s. 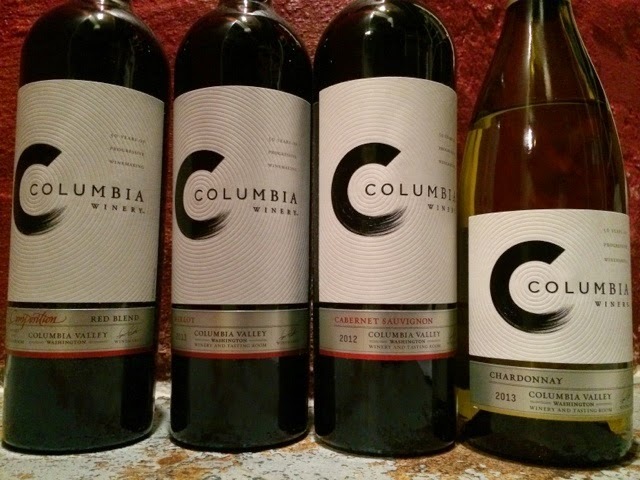 Today, by virtue of what appears to be a newly-struck marketing agreement, the rebranded Columbia Winery bottlings should be found and widely available nationally. It's also nice to see that they've come into the broader market with an aggressive pricing structure. Though the prices listed below are suggested retail, I suspect that in most places you will find them for a few dollars less. That puts them in real competition with the other major Washington wineries. I think they will compete just fine. Generous and spacious, though not cloying or overly residual from weight. Pleasant, if two dimensional, but a value at the price. A penetrating nose is followed by big, deep fruit with light framework. Flavors are blue-black with gentle acidity. Plump and relaxed. Did they get the Merlot bottles confused with the Cabernet bottles? Far more similar to what you're likely accustomed to from Cabernet then Merlot. Taut, more structured, and possessing some nice high toned notes on the finish. Data point number 103 as to how Columbia Valley will be the epicenter of Merlot's much-deserved redemption. Without a doubt my favorite of the four. Interesting that it is a non-vintage, but I'm not going to hold that against it one bit. Terrific structure, good grip, and mouth coating, powdery tannins all stitched together in a bespoke fashion for terrific results. I will be seeking this out again in the near future. Bravo. This is my most memorable wine of the year, from my most memorable winery visit of the year.